Staging your home inside and out this holiday season may mean the difference between selling your home before the New Year or waiting until after. 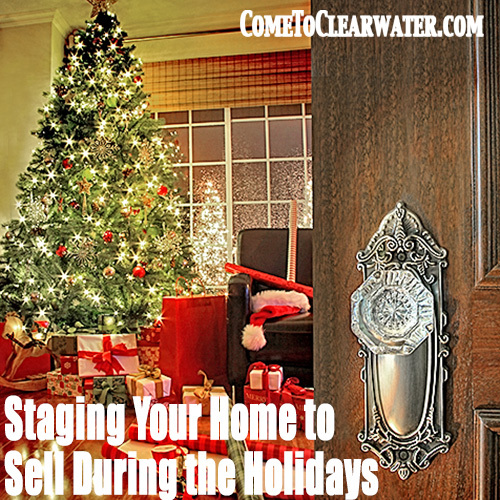 Here are some staging ideas for your home this holiday season. Staging your home means inside or out, your home must be clean! Outside, neaten up the yard, deck, porch and sidewalks. Weed and clean out planting beds. Prune trees and shrubs. Pack away bicycles, sports equipment, toys, and so forth and store them offsite. Inside, clean your home from top to bottom and declutter each room. Move excess furniture out of rooms. As you clean, inside and out, repair things that need it. Paint where necessary, caulk, and re-grout, spackle holes in walls and make things look new. Selling your home will depend on it being clean and repaired as well as staged. Staging your home includes your garage and storage areas. Store anything you can off site. You want your yard, storage sheds, garage and closets/storage areas inside your home to be uncluttered and neat. The bigger they look the better. People buy space, especially storage space. If you are selling your home, just remember that you are going to have to pack and move anyway, so this will give you a head start. It’s the holidays, so decorate. The key to staging with holiday decorations is to keep it tasteful. Don’t go nuts with lights and yard “ornaments” outside: no blow up Santas, snow globes or any other gaudy yard decorations. This is not the year to win the decoration contest in your neighborhood! Maybe lights on the shrubs, a wreath on the door. Another idea to make your home look attractively decorated is to find an old sled and dress it up with some greens and a bow and set it by the door. Festive, not gaudy. Inside keep holiday decorations tasteful as well. A tree, maybe some greens on a fireplace mantel, decorated but not out of control. While Christmas and Hanukkah are religious holidays, keep these holiday decorations to a minimum. Yes, keeping true to your faith is important, but not everyone celebrates as you do. Check on the web at places like HGTV or DIY Network for good ideas on how to decorate tastefully, but without going overly religious. Staging your home at the holidays is easy, just keep it tasteful and you’ll be selling your home in no time!